Beacon Press: "They Take Our Jobs!" 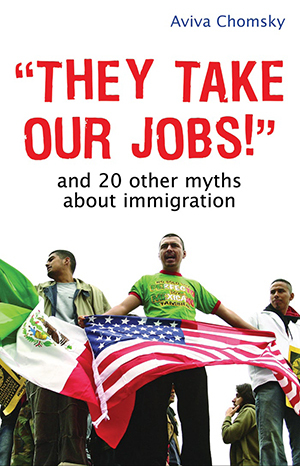 Claims that immigrants take Americans’ jobs, are a drain on the American economy, contribute to poverty and inequality, destroy the social fabric, challenge American identity, and contribute to a host of social ills by their very existence are openly discussed and debated at all levels of society. Chomsky dismantles twenty of the most common assumptions and beliefs underlying statements like “I’m not against immigration, only illegal immigration” and challenges the misinformation in clear, straightforward prose. In exposing the myths that underlie today’s debate, Chomsky illustrates how the parameters and presumptions of the debate distort how we think and have been thinking about immigration. She observes that race, ethnicity, and gender were historically used as reasons to exclude portions of the population from access to rights. Today, Chomsky argues, the dividing line is citizenship. Although resentment against immigrants and attempts to further marginalize them are still apparent today, the notion that non-citizens, too, are created equal is virtually absent from the public sphere. Engaging and fresh, this book will challenge common assumptions about immigrants, immigration, and U.S. history.